Delaware State officially unveiled its newest jewel Friday, a glistening, glassy structure that will house the university’s renowned optics program. The Optical Science Center for Applied Research, or OSCAR, building stands 75 feet and occupies 28,100 square feet — roughly half the size of a football field. Its symbolic meaning, however, is far larger. As the new home of Delaware State’s signature research program, OSCAR is a physical manifestation of the university’s attempt to become a regional heavyweight in the so-called STEM fields of science, technology, engineering, and mathematics. 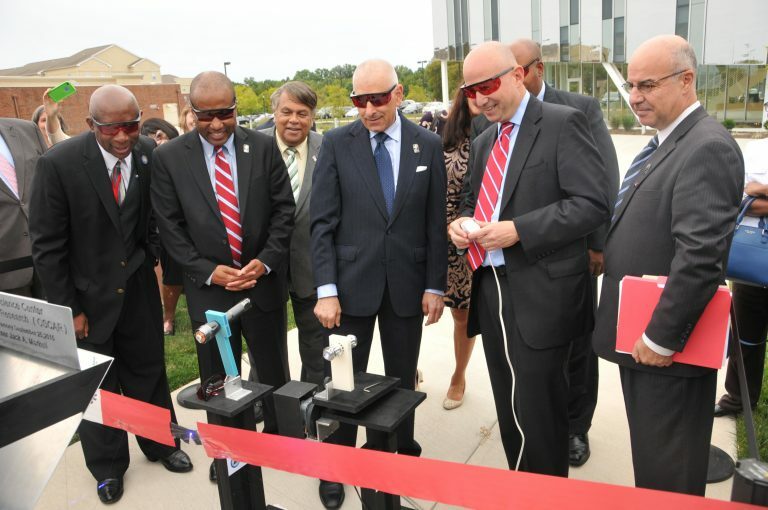 Since optics technology can be used across various scientific disciplines, Delaware State hopes its sparkling, new facility will make the historically black college a beacon for researchers in the Mid-Atlantic and, perhaps, beyond. “Optics is an enabling technology,” said Noureddine Melikechi, the director of OSCAR and the father of Delaware State’s optics program. Within its 12 laboratories and 26 offices, the OSCAR building also has room for start-up or technology companies who may want to lease space. As of yet no businesses have moved in, but Melikechi said he has received interest. “This building is about the convergence of science, technology, and business,” said Melikechi, who first came to Delaware State as an associate professor in January of 1995. School officials took Markell on a tour of the OSCAR building, where they flaunted the building’s open design and the research possibilities contained within. Optics, a category of study within the physics field, concerns the use and manipulation of light. Melikechi showed the governor how sophisticated optics technology can be used to analyze material from Mars, detect and treat cancers, and deliver personalized medicine. Delaware State’s optics program has grown into the university’s showcase research program under Melikechi, bringing in tens of millions in federal grants. In 2012 alone, the optics program scored a $5 million grant from the National Science Foundation, was part of a NASA mission to Mars, and broke ground on OSCAR. Construction ended in June 2015, revealing a steely, monochromatic edifice that stands in stark contrast to the brick and stone around it. The building’s interior is clean, white, and airy, with a sanitary feel. The three-story structure revolves around an open stair case lit largely by the natural light that filters through its glass roof. The building’s shape is that of a cube cut diagonally, with the open face pointing toward bustling Route 13 in Dover. The university hopes to add a companion building of nearly identical proportions that would stand just yards from the current OSCAR building. Together, the buildings would appear like two halves of a cube facing one another. As of now, there is no announced time line for the building and construction of that second facility. For the moment, at least, university officials are taking the chance to simply celebrate what they have already built.